I've tried to make using the AWC as simple and intuitive as possible. The things you are likely to change most often are presented on the very simple main page. If you hover your mouse over one of the elements of the screen you will get a pop-up tooltip that gives a short description of what it does. You can manage the set of pictures you want to display in two ways. The traditional AWC way is by folder. 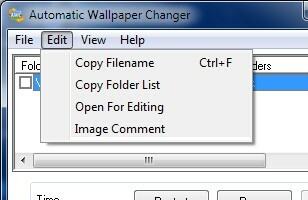 In this mode you select the folders that contain your images and AWC will select an image at random and display it. You can also switch to by file mode and select your image files individually. This mode lets you pick the files you want, either by clicking the Add button or by dragging them into the list from Windows Explorer, and display them in different sort orders rather than at random. On the right you can see AWC in folder view. File view is very similar and is shown below. 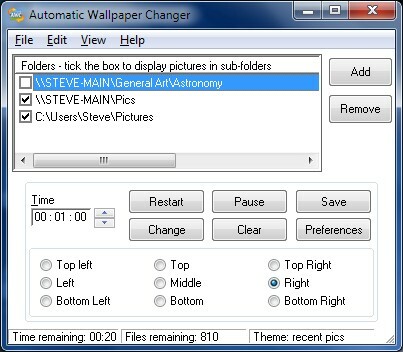 Folder view is the simplest mode for using AWC: just pick a folder with images in it and click Restart. Use the up and down arrows to change the amount of time you want to elapse between changes. You can select one of the option buttons to determine where the picture should be displayed on the screen to best suit your requirements. Please note that the positioning does not work if you have active desktop enabled AND active content displayed. This is a limitation of Windows not of AWC. Restart: Restarts the change process by applying any changes you have made to settings and changing the desktop wallpaper immediately. The list of files that will be used in the change process is built at this point. If you add more files to the source folders they will not be displayed unless you restart the process or enable the Check For New option on the preferences screen. Pause: Stops the timer so that the change process will not be triggered. Clicking again will set the timer going again. Save: Saves your current settings. If you don't have any specific theme loaded they are saved to the registry and will be loaded the next time you open AWC. When you open AWC after settings have been saved to the registry the change process will begin immediately and the program will be minimised. If you have a theme loaded the settings are simply saved ready to be loaded again later. The Save button is normally disabled. It becomes enabled when you make changes to your settings. This serves as a reminder that you should save your settings if you want them to be used in your next AWC session. Of course there is an option to save your changes automatically on the preferences screen. Change: Change the picture immediately. Clear: Clears the desktop . By default this just clears your desktop of any wallpaper and displays the windows background colour. You can change the way the clearing process works in the preferences screen so that the wallpaper that was displayed before AWC started or a specific screen snapshot is restored when you select Clear. Preferences: Opens the preferences screen so you can change the way the images are displayed. This is where the real power of AWC lies and it is worth experimenting with the various settings to get things just how you want them. Use the Add button to open a dialogue box that allows you to select one or more files. You can also add image files by dragging them from Windows Explorer and dropping them onto the file list. You can drag and drop folders too: all the files in each folder will be added. You can sort the files into different orders by clicking the different column headings. Clicking the first time sorts in ascending order, clicking again resorts into descending order. To create a random sort order just click the Randomise button. If you right click on an item in the list a popup menu will appear that allows you to do various things including display the selected image immediately (if you have a multiple monitor system you can can select which monitor you want to display it on). 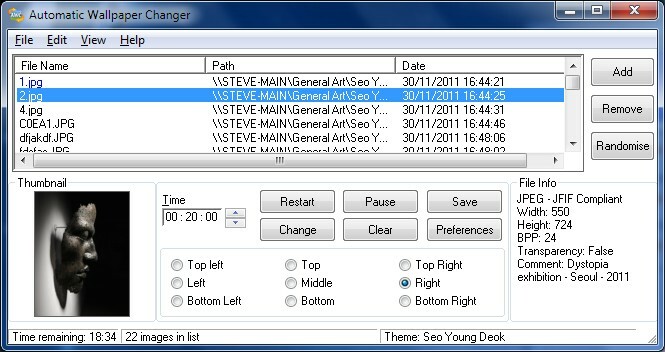 There are several menus which allow you to access functions that are not available from the buttons on the main screen. Displays the next picture in the list on the desktop. Redisplays the picture that was displayed prior to the current one. Deletes the physical file that is currently displayed on screen and selects another one from the list. By default this simply removes the desktop picture and resets any positioning that has been set. 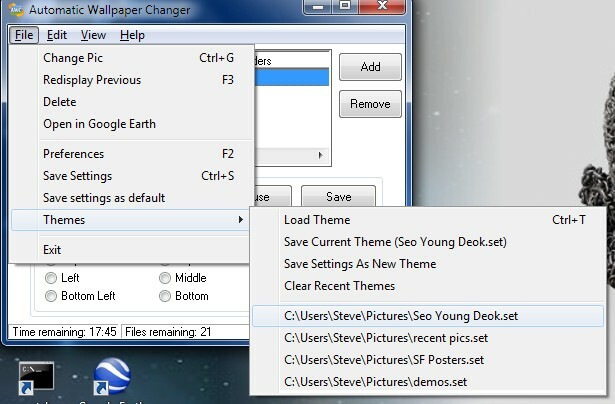 This ensures that you can use Windows own desktop settings page to set a desktop wallpaper and it will use its own positioning rather than trying to use that previously set by AWC. You can modify the way this function works so that it redisplays the desktop picture that was displayed before AWC started. The Themes menu allows yo to save your current settings (folders or files and preferences), to disk to be loaded up again later. So, if you've picked folders containing family pictures and you've displayed them with a nice fade effect onto a background image of birthday wrapping paper, you can save that set-up as a theme called Birthday.set. The next time you want to view the theme you just need to load it again and all the pictures and settings will be restored. Copies the fully qualified path and file name of the file currently displayed to the clipboard. Copies the set of currently selected folders to the clipboard in a format that can be used when creating your own program shortcuts. Opens the file that is currently displayed in the default editor for that file. Note that this requires that the file type has a file association configured for it. You can override this behaviour in the preferences screen, see below. On a multi-monitor system this moves the images that are currently displayed around on the desktops. So on a two monitor display the images will be swapped around. On a three monitor display the images that are on monitors 1-2-3 will be moved so they are on 2-3-1. There are a number of prompt messages in AWC that a user is allowed to suppress by clicking a checkbox on the message which says Do not show this message again. You can reenable the messages you have suppressed by clicking this menu option. Displays information about AWC including registered user name or evaluation time remaining. Opens the AWC Registration page in your browser. Opens the Registration window so that you can enter your registration details. You need to be logged into Windows as a user with admin rights to register. That's because the registration data needs to be written to an area of the registry that is accessible by all the users of the PC. If you have trouble registering under Vista because UAC is enabled see this support forum post for the solution: http://www.smurphy.co.uk/board/viewtopic.php?t=3981. Connects to the AWC web site and checks to see if a newer version of the software is available. 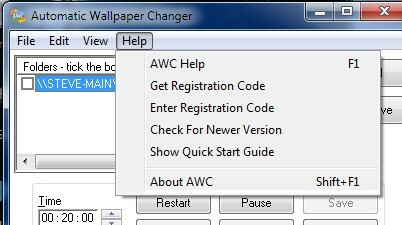 If there is AWC can automatically open your web browser on the AWC download page. You can tell AWC to check for updates automatically on the General tab of the preferences screen. Pops up the Quick Start guide that was displayed the first time you used AWC. This is a very brief guide to how AWC works. You can change the way that AWC works by setting your own preferences. 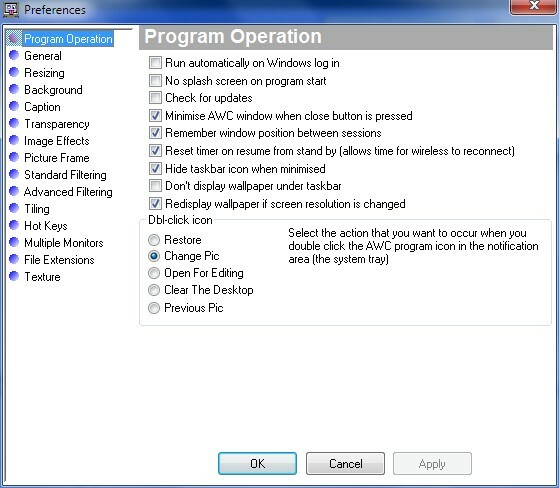 The Preferences screen is activated by clicking the Preferences button on the main screen or hitting the <F2> key or by selecting the Preferences option on the File menu. There are a lot of different settings available but the most common ones are switched on for you at installation time. To make finding the option you want easier the preferences screen itself is divided into pages which group similar types of option together. Just click on an item in the list on the left of the window to view that set of settings. The newest design of the preferences screen tries to ensure that there is adequate explanation of each option right there on the page. Additionally many options will display a pop-up tooltip with additional information if you hover your mouse over it. Some options even provide detailed web-based help just by clicking on their text. It's easy to identify where this extra help is available as the mouse cursor changes to show a question mark. When you click, your default browser will be opened to display the web page. This will override whatever picture folder you have saved and display pictures from the C:\Pics\Space Pics folder instead. All your other saved settings will still be used. Note that starting AWC with a command line when there is already an instance of AWC running, will close the earlier instance. Simplest is to have a shortcut to AWC on your desktop and just drag and drop a folder onto it from Explorer. The dragged folder will be used as the picture source. Create a shortcut in your SendTo folder so that it appears in your Send To list in Explorer. Most sophisticated of all is to create a file association on folders, that adds AWC to a folder's context menu. In XP you do this by opening Explorer and selecting Tools/Folder Options on the menu. I haven't tried it on other versions of Windows. My thanks to Mark Holden for this suggestion which prompted me to modify the program so that the new instance would replace the old. Mark said he had a bit of a problem setting this up under XP: his notes on solving it are here. The upshot is to make sure you create the association on the Folder item and not the File Folder item. The few exceptions (there's always an exception) to this format are the /SAVE, /NOSPLASH, /NOTRANS and /NOTRAYICON settings which are used without any additional options. The syntax for each switch is described on the next page >>.